This is accessed from "More, Options..." on the Line List Window. It allows adjustment of the choice of lines displayed when right clicking on the main spectrum window. It is often the case that weak unrelated lines are close to strong lines in a given simulation, and the options made here control to what extent these are displayed or used in peak measurement. Discard lines that are weaker than the indicated fraction of the strongest lines. Lines calculated with exactly zero intensity (which may well be forbidden in the absence of specific interactions) are not displayed in the line list unless this is unchecked. 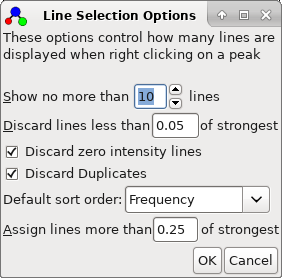 When right clicking on a line in a simulated spectrum that is already in the line list, do not add to the list if this option is selected. If no lines are added by a right click, the first duplicate line is selected in the line list window. To always add lines, turn off "Discard Duplicates" or use Shift+Right Click for a one-off override. When measuring and assigning lines with the mouse, only assign lines stronger than the given fraction of the strongest.